I was a bit wary to read it at first despite the great reviews because the blurb did absolutely nothing for me. New Beijing, cyborg, intergalactic struggle? Yeah, not for me. Knowing this is a Cinderella retelling didn't help either. I really couldn't wrap my head around the world of Cinder. But I eventually gave in. AND I WAS FREAKING BLOWN AWAY! Marissa Meyer is an incredible writer! She was able to create an entirely new world that was actually believable. The story could've easily sounded ridiculous because of the whole post-World War era where cyborgs, androids and Lunars (moon people) exist. But Meyer's writing is super good (I have got to work on my adjectives). Since this is written in the third person POV, some chapters weren't solely about Cinder. The transitions were smooth and the sequence of events really added to the overall excitement of the story. You can never really tell how the story or the retelling would go. I devoured the book so fast because of how the story was written. You can't read just one chapter and do something else after (unless you have to do something really important). It's that addicting, folks. Cinder is made up of a brilliant cast of characters. Cinder has such a great personality that's easy to love from start to finish. I enjoyed reading her thoughts and how her being a cyborg affected her. She's kind but she's pretty kickass - a major difference between her and Cinderella. This is probably the biggest thing I like about the book. Maybe I'm just a feminist but damn it I want strong female characters! Cinder's definitely one. I love all the many ways Cinder's story was just like Cinderella except for a few alterations. She didn't have a fairy godmother but she has an android, a nice stepsister and a doctor helping her out. She's strong and she fights back. She's simply a great character overall. The villains were also equally amazing, I admit. They got my blood boiling, alright! I love it when authors create really despicable villains that make you feel so much hatred towards them. You know they'd be evil but somehow they can still get under your skin. I'm not kidding! Then there's Prince Kai. Oh Prince Kai. I like the romantic non-romance in this book. I really don't know what to call it. It was feels-inducing. The anticipation alone would excite you. And maybe it was just the secret (not so secret now) part of me that wants to be noticed by some well-known person (like a prince!) that has me feeling like this. I don't know! But I do know that Kai is a very likable character even if you don't see a lot happen between him and Cinder. Not yet, at least. The subtle (very subtle) romance is definitely something every reader would want to see in the following books. There are a lot of other things I'd want to discuss but I don't want to spoil anything for you all. That and I don't want this review to sound like I'm only fan girling. Cinder is a great kick off to a series that has a lot of promise. Yes, it's a retelling but somehow it still feels original. There were things in Cinderella that Meyer put her own twist on and they made the story even better. I'd love to see how the whole series would tie up. The ending left me both satisfied and craving for more. I got what I wanted from the story but at the same time, I'd want to know what else would happen. So... 5 stars for a book that is seriously addicting. Marissa Meyer lives in Tacoma, Washington, with her husband and three cats. She's a fan of most things geeky (Sailor Moon, Firely, color-coordinating her bookshelf...), and has been in love with fairy tales since she was a kid, something she doesn't intend to ever grow out of. She may or may not be a cyborg. 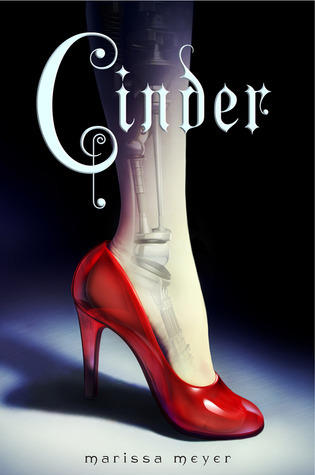 Cinder, her first novel, debuted on the New York Times bestseller list. Love your review! I can feel how much you held back fangirling, knowing how much we love this. Haha! Great review, I LOVED Cinder. I agree, the twist that Meyer put on the story was fantastic and unique and truly captivating. Hopefully you love Scarlet, I did! Just finished reading this and all I can is WOW. This book is amazing. Bought this because of your review. Thanks Isabel. :) Need to buy the next book. Will you be reviewing it as well?